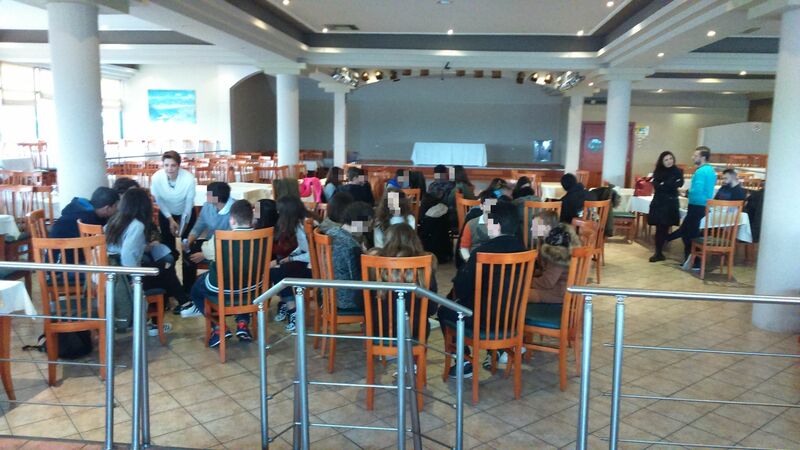 A meeting of 9 schools which participate in the project Erasmus+ “Otherness”, 2015-1-BG01-KA201-014300 took place in Kerkini lake, Serres at 9th March 2017. The project is implemented through the collaboration of 4 organisations; Prosveta Sofia Foundation (applicant organisation – Bulgaria), AENAO – Center of Non Formal Education (partner organisation – Greece), CSC Danilo Dolci (Partner organisation – Italy) and IPS Santarem (partner organisation – Portugal). The meeting was organised by the Directorates of Secondary Education – Departments of Health Education in Serres (Mrs Efthimiadou Sofia) and in Thessaloniki (Mrs Christidou Christina) due to the context of Bullying in Schools. Prefecture of Thessaloniki: 2nd Gymnasium of Ampelokipi, 4th Gymnasium of Stavroupoli, 1st Gymnasium of Efkarpia, 4th Gymnasium of Evosmos, 2nd Gymnasium of Chalkidona. Prefecture of Serres: 1st Gymnasium of Serres, Gymnasium of Nigrita, Gymnasium of N. Zichni, Gymnasium of Skotousa. Students had the opportunity to meet together in a safe environment where they were learned through methods of NFE about “Otherness”, Diversity and Bullying in Schools. Students were trained by the educators; Mrs Efthimiadou Sofia and staff members of “OASIS” – Center of Drug Prevention in Serres (okana.gr) regarding the phenomenon of bullying in schools. Training was held in workshops where students learned and undertstood aspects of school bullying and focused on causes and consequences. In addition they informed on UNICEF’s Convention on the Rights of the Child.